Description: As if traveling to a new country in search of her missing mother weren't difficult enough, Mira has to do it dressed as a boy. In a different century. A new postcard from her time-traveling mother points Mira to the 16th century Rome. But before she can rescue her mom, she must follow the clues left around the city to find Giordano Bruno, a famous thinker and mathematician, who discovered something so shocking that important Italian officials don't want it revealed. All the while avoiding the Watchers--time-traveling police who want Mira back in her own time. 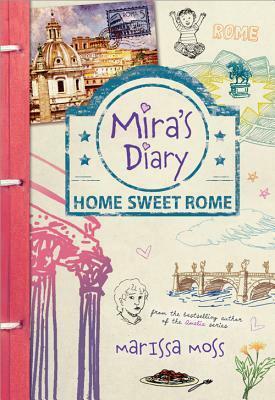 It's another whirlwind adventure for Mira, and this time she is determined to bring her mother out of the past. "I stood there frozen with doubt, while unshaven, unwashed people jostled around me. I'd had no idea what great inventions soap and shampoo were." "It's easy to defend people you like. The hard thing is supporting those you don't." "That's in Florence where they charge you to enter any church. But we have to go through a security screening." "You're kidding!" Malcolm rolled his eyes. "What's the Pope afraid of? Doesn't he have God on his side?" I agree this is more history than story. I'm currently reading it with my daughter and she thinks it's okay but not much else.